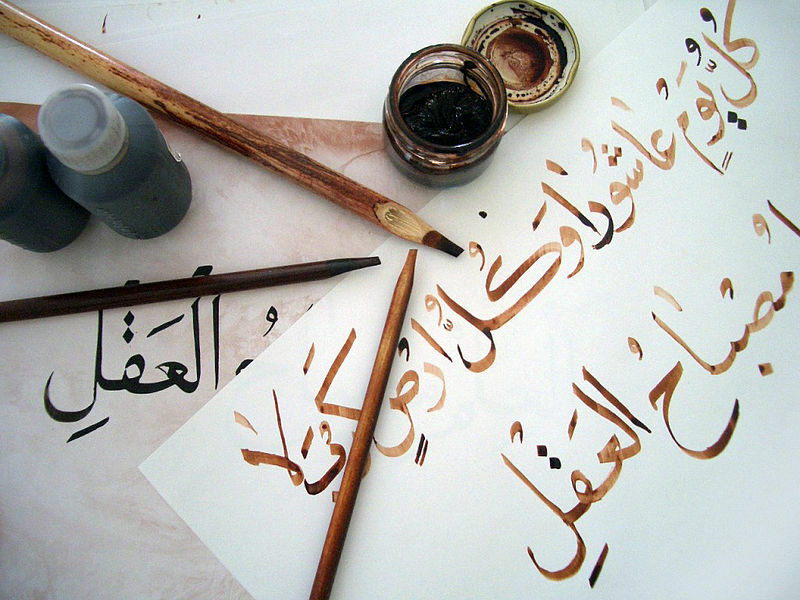 From April 1st to May 1st The Sharjah Calligraphy Museum in the United Arab Emirates hold its biennial exhibition of not only Islamic calligraphy, but for the second term running has invited internationally celebrated calligraphist of other traditions including Tibetan calligraphy to participate. "i am delighted to be invited back to exhibit with the Sharjah Calligraphy Museum, as i have always held a high regard for Islamic art. Islamic Calligraphy could be argued to be one of the most evolved and decorative writing systems of the world, so i feel particularly honored to be exhibiting along side such excellence. This time the theme "Universe" see below was given to inspire the participants in their creations for the exhibition. This lead me to create three pieces for the exhibition, exploring the interrelationship between heaven and earth, the ultimate and the relative spirit of mankind". Two of three art pieces submitted by Tashi are shown below, the second piece "The Great Perfection Aa" can be seen in an earlier blog post here. The Absolute and Relative Truths. When speaking of the spirituality of man, this implies an ultimate or absolute that is pure and next to godliness. If there is ‘absolute’ then there must be ‘relative’ which can be considered mundane and unholy. These two ways of existence can be called the two truths of absolute and relative. Psychologically in the realm of heaven and earth, the ‘absolute’ is symbolically placed above and the ‘relative’ is placed below. Just as the calligraphy, the words ‘absolute truth’ is above and ‘relative truth’ is placed below. 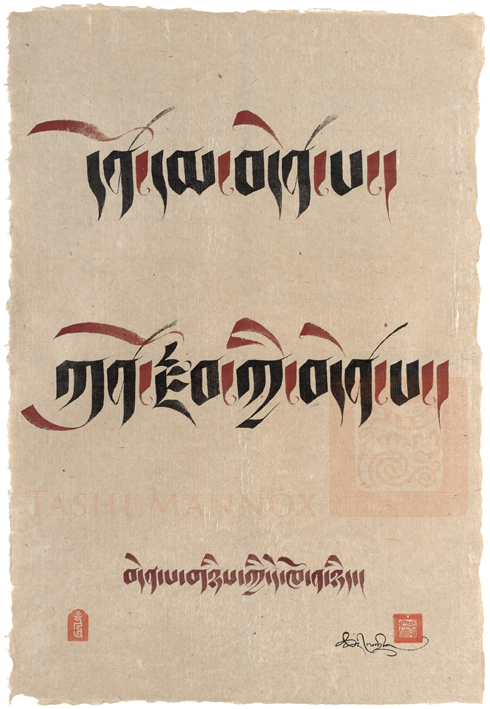 The Tibetan script style used is a form of ornate Petsug, typical of holy manuscripts. The lower most line of text translates as “The thatness of the two truths”. Especially created for the Sharjah Calligraphy Biennial 2012 ⓒ Tashi Mannox, 57x84 cm Chinese ink and Japanese mineral paint on Bhutanese Tsasho paper. The letter remains not only as a means of expression within the linguistic context but also it is used as an instrument for research in the spaces of light which rules the making of time and space. This is due to the interrelationship of antitheses of the knot of existence or to the merger of components in the splendor of the universe and nature. The artist, who through his consciousness, gets his inspiration from those possible and potential relationships, embodied in the mosaics of this great universal painting, takes the spirituality of his soul and creativity, to bring these facts closer to each other, and, discovers the individuality of the letter, being an image and an echo of the greatness of the creator and Man. The rich experience of the artist shows that the letter is a universe by itself, from which all meanings of existence stem. It is a mirror that reflects all the visual revelations that are enriched with knowledge and infinite light, revealing a spirit extending towards psychological and subjective links. The letter, therefore, is the key of reflection and search for similarities and differences to gain more faith. 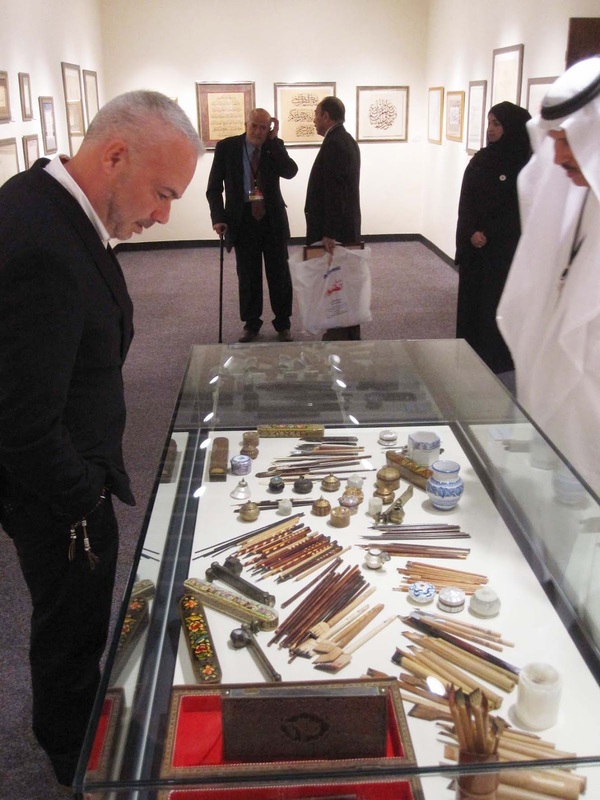 Sharjah, as usual, opens this forum, Sharjah Calligraphy Biennial, to be a source for the creative art of calligraphy, revealing the renewable and infinite worlds of innovation in this field. In its new session, the biennial presents a new space for reflection, and re-production, leading to an intellectual and innovative spheres, revealing an infinite artistic creativity. Just as traditional Tibetan calligraphy.